Boxes for shipping guitars help you easily and safely ship your guitar from one place to another. While we don’t look at shipping as a major problem, for guitars, which are very sensible products, it can be a major factor. One way to approach this matter is to hold on to your guitar packing box in which it originally arrived. But, if you are reading this, you have probably not done this initially. No problem, we have the solution for you. 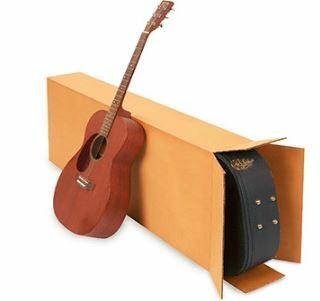 Guitar cardboard box 20” x 8” x 50” – This larger size will fit most guitars and cases. I say most because there are always custom-made cases. For sizes larger than this, you will have to search through boxes for different purposes and customize one of those. Guitar cardboard box 18” x 6” x 45” – This smaller size is good for children guitars or even for some closer to standard size. I would personally double check the size of my guitar case before buying this one. There is no difference between an electric guitar shipping box or an acoustic guitar shipping box. Both of the two can easily be stored in a cardboard guitar box. Just make sure you have checked the shipping box sizes before you make the purchase. One thing you might have to consider are accessories, or if you are shipping the guitar with other parts next to them. In that case, make sure you get the bigger box. Before inserting them into the cardboard shipping box, you will have to prepare the guitars. There are two possible scenarios in which you may find yourself. One of the scenarios is that you don’t have a case to put the guitar in, and the other that you have. If you already own a case, it will make your life easier, especially for shipping purposes. Guitar cases don’t come cheap, especially new ones. Lay the guitar into the case as you would normally do. Some stretch foil would be great to wrap around the guitar, just for extra security and especially, moisture. After you put it into the case, just fill the rest of the gaps with softer material or even newspapers. Filling the gaps not to tight, will allow a little play and cushion for any further shocks during transport. Most likely this won’t be needed during your transport, but it’s better to think in advance and just invest the time. It’s like an insurance policy, you’ll just feel better after doing it. Wrap some more stretch foil around the case, and maybe a further paper cover would also be good. The stretch foil will keep the case closed in most circumstances. The paper cover should also help for any possible scratches. But you can skip this if you used the stretch foil. Ok, this is a more difficult task, to be honest. But if you don’t have a case and you must ship the guitar, you have to do it. First of all, just buy the bigger sized box. If you are sending a guitar for children, then you can go for the small one. But as long as you have a normal guitar, you will need all the space for packing. Second of all, get some bubble wrap. If you don’t have bubble wrap, go for old newspapers or large sheets of paper. You will also need stretch foil. Quite a lot actually. What you will have to do with the 3 items I mentioned is to recreate a case. Of course, this does not have to be as tough as the case or have the exact shape. But you get what I am saying. Lay the stretch foil on the floor and put the guitar over it. Use paper crumples around the guitar and its empty spaces. After gaps are filled, do a first roll around with the stretch foil. The guitar should look as it is cushioned around by the paper crumples. Next, further cover the rest of the guitar with paper. Use 3-4 layers of paper and it should do the trick. This is just another layer of protection, not the main protection layer. Now use the bubble wrap to wrap around your guitar 3 or 4 times again. The bigger the bubbles, the better the protection. While doing all this, make sure the guitar will still fit into the box. Use some more stretch foil again to firm the bubble wrap and you should be good for packing. Your main task here is to make sure the guitar is not moving around in the box. The ideal place would be for it to sit in the middle of the box and have cushioning paper around it. It will also work if you slide the guitar to one edge, and just fill in the rest. In this case, your guitar might not be as well protected. So it’s better to invest a little time in this aspect. Try and fill the space around the guitar with paper crumples. Once you make sure your guitar is not moving inside, you can close the box. Use normal tape, and try to go around the box at least twice. This will add further resistance. Now, the outside area of the shipping box. I personally recommend using stretch foil and going around it 3 or 4 times. Doing this will further enhance the resistance of the shipping box. Another thing it does, it protects the actual shipping box. If you are unlucky, the shipper will drop the box in a puddle. The box starts to deteriorate, and as it goes through hubs it breaks down totally. What the shipper will do is take the guitar out and ship it like that. Most of the times they won’t repack it. Use the stretch foil to be protected in this kind of situations. You won’t be sorry for investing a bit of your time.